These are interesting times for a wine economist! I’ve recently been interviewed by a national newspaper (wearing my international economist hat) about the presidential candidates’ policies and then by a popular supermarket cooking magazine (in my wine economist role) about exchange rates and rising wine prices. The dollar hit a new low against the Euro earlier this summer and although it has rallied a bit of late, Euro-zone imports are still very expensive. This affects the wine market in a number of way. Old World wine import prices are being pushed up as the strong Euro works its way through the distribution system. Producers and distributors have tried to postpone price increases, but I think they have run out of wiggle room, especially with high energy costs pushing up transportation costs, too. There is pressure to raise domestic wine price, too. Increased exports (the benefit of a weak dollar) have drained some of the domestic surplus. Those surpluses were a reason for low wine prices earlier in this decade, but they will soon be gone as we move through the Turrentine boom and bust wine cycle. (Unexpectedly large 2008 harvests in Australia and New Zealand, however, will moderate price pressures a bit in some market segments). The cheap dollar is probably also at least partly responsible for soft Euro prices of French en primeur wines and the recent sale of the iconic California producer Chateau Montelena (of 1976 Paris tasting fame) to a French buyer. The Euro’s high cost has discouraged U.S demand for wine contracts (although indications of a weak vintage are also a factor) while the cheap dollar makes U.S. wine assets a relative bargain for foreign investors. Exchange rates affect all international businesses and wine is no different. This is one reason why large wine companies go global, sourcing products and managing brands from many regions. Troubles in one area can be offset by opportunities elsewhere. Wine prices in the U.S. appear to be heading up – what’s a bargain-seeking shopper to do? That’s the question I was asked by the wine and spirits editor of a major cooking magazine. The answer is to try to make the exchange rate work for you, not against you. The Economist magazine’s Big Mac Index can help. The Big Mac Index, which appears in the July 26, 2008 issue of the magazine, is a simple indicator of whether a currency is over-valued or under-valued relative to the U.S. dollar based on the price of the ubiquitous fast food entrée. The Euro, for example, is estimated to be overvalued by about 50 percent. A $3.57 Big Mac costs the equivalent of $5.34 (50 percent more) when purchased at Euro-zone prices at the prevailing exchange rate. European Big Macs are overpriced for dollar-holding buyers by this measure and so is just about everything else, including European wine. (The worst place to buy a Big Mac, according to the index, is Norway, where it costs the equivalent of $7.88 – ouch!). The Big Mac index is a crude way of measuring the relative purchasing power of different currencies (to do this properly is a very complicated process), but the burgernomic indicator is generally surprisingly robust. It is pretty closely reflects the perceptions of tourists and traders and is often consistent with the more scientific results of detailed academic studies. Who knew that hamburgers could be so useful? Where are most favorable exchange rates in the wine world for dollar buyers? The Big Mac index points to Argentina, Chile, Uruguay and especially South Africa. The South African Rand is undervalued by 37 percent according to the Big Mac index – that $3.57 hamburger sells for the equivalent of just $2.24 in Capetown. The cheaper Rand results in cheaper South African wines, even taking into account high transportation costs. That is helping these wines break into the U.S.market, although there is more than exchange rates involved in this process (watch this space for an upcoming report). 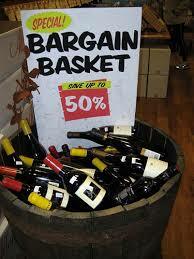 But Southern Hemisphere wines aren’t the only bargains. Washington State wines are exceptional values at every quality level and I included them in my cooking magazine recommendation list. Washington wines don’t benefit from an undervalued currency. Instead they suffer somewhat from an undervalued reputation, which results in relatively lower prices for the quality. There is so much focus on high profile California wines in the U.S. that great wines from other regions don’t get the attention they deserve. This condition, like today’s exchange rates, won’t last forever, so take advantage of it now.